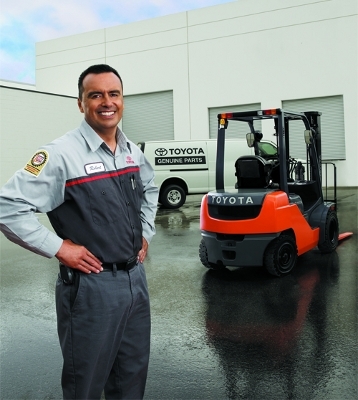 Allied Toyota Lift provides 24-hour service, emergency repairs and planned maintenance on all types and brands of forklifts and material handling equipment. You choose your service location — at your facility or at one of our three locations. Allied's forklift repair & maintenance department is committed to providing quality forklift service at affordable prices. Over 25 centrally-dispatched and fully stocked GPS service vans on the road. Most brands repaired including Toyota, Clark, Mitsubishi/Cat, Yale/Hyster, Nissan/TCM/Unicarriers, Komatsu, Crown, Raymond, Linde. Customer Service representatives available to answer questions and provide quotations for needed repairs on all equipment.